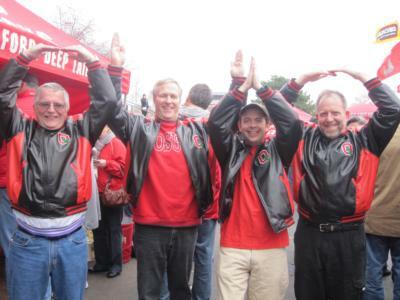 Buckeye Blend is THE comedy quartet, featuring OSU Tailgate parodies and humor that always bring smiles and laughter to our audiences. 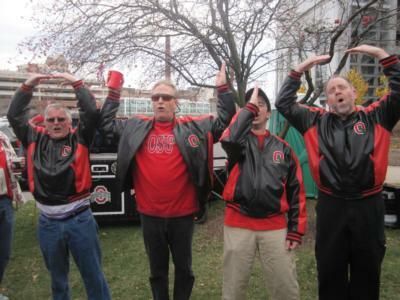 Avid Ohio State fans especially appreciate the amusing lyrics to familiar songs, and those that may not bleed Scarlet and Gray still marvel at the wit and entertainment that The Blend provides with our excellent singing and presentation. Buckeye Blend has entertained in all venues; from tailgate parties to formal dinners and receptions, churches and theaters. We have two very successful CD recordings which have sold thousands of copies. Please note Buckeye Blend Quartet will also travel to Westerville, Blacklick, New Albany, Worthington, Lewis Center, Reynoldsburg, Galena, Dublin, Powell, Groveport, Hilliard, Pickerington, Johnstown, Pataskala, Amlin, Grove City, Canal Winchester, Sunbury, Unionville Center, Alexandria, Galloway, Lockbourne, Croton, Marysville, Baltimore, Delaware, Plain City, Centerburg, Carroll, Broadway.